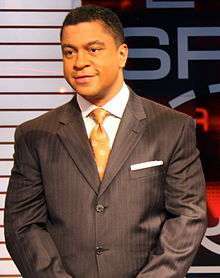 Stan Verrett (born 1967, in New Orleans) is an anchor on the ESPN and ESPNEWS networks in the United States. Most of Verrett's appearances are on SportsCenter at 11 p.m or 1 a.m. Eastern time, Monday through Friday. He has also hosted studio segments on ESPN's college basketball and college football telecasts, and has appeared as a sideline reporter, working ArenaBowl XXII. He was also known as "Stan The Man", a radio DJ on WOWI 103 Jamz in the Hampton Roads, VA area. While in the area, Verrett was a sports anchor on ABC affiliate WVEC-TV 13 and also had a stint on local NBC affiliate WAVY-TV 10. Verrett was born and raised in New Orleans, Louisiana. His boyhood home was destroyed by Hurricane Katrina. He attended St. Augustine High School and Howard University Washington, D.C. in 1989, where he was one of the two outstanding graduates with a Bachelor of Arts in journalism. Verrett is a member of Alpha Phi Alpha Fraternity, Inc. He was initiated at the Beta Chapter on the campus of Howard University. In April 2009, Verrett began working from ESPN's then-new L.A. Live studios, anchoring the 10:00 p.m. PST SportsCenter along with Neil Everett. In August 2016, he was named studio host for ESPN's college football coverage airing on sister network ABC, replacing John Saunders, who died earlier that month. He is cousins with Jason Verrett.